I guess like parenting, dog raising doesn't have a perfect manual. This is the reason why I find it important to read books such as What If My Dog...? by Jim Evans. Just like Dr. Bruce Fogle's book, it aims to teach us dog owners how to enjoy our life with our four-legged friends to the fullest (armed with information to prepare us for canine mishaps and dog issues). Have you ever asked yourself, "What if My Dog... pulls.. won't eat... barks... is aggressive... jumps up... is shaking... soils the rug?" This is also one of the first books I've bought as dog lover. It's an easy read as it goes straight to the problem rather than provide brief histories and backgrounds before going to the canine nitty-gritty. 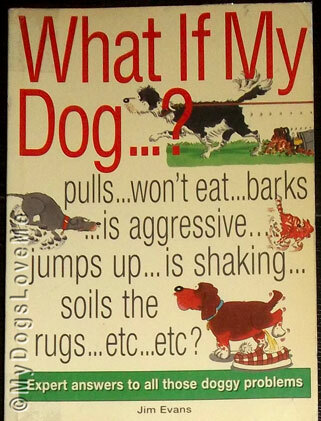 It's not that Dr. Jim Evans skimped on dog behavior and its causes. In fact, he reserved an entire chapter on how dogs learn, how dogs act, how dogs communicate. 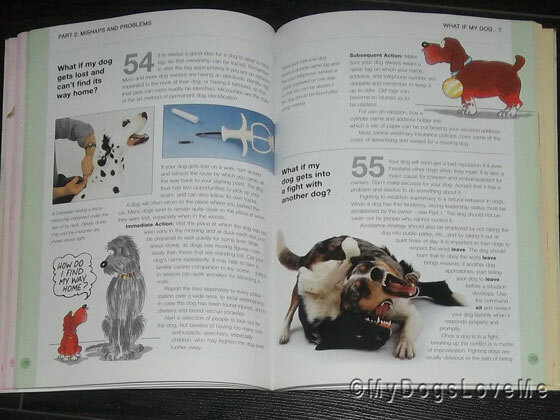 Number 55 says, "What if my dog gets into a fight with another dog?" So as for the question, is it a good dog book for novice and existing dog owners? Yes, Indeedy! The way the scenarios were presented (with pictures and interesting canine comic drawings) makes it easier to read and more convenient. Preventing Inappropriate Behavior takes an entire page. Its second page elaborates the advantages of crating. The pictures are entertaining and the color coded chapters keep it categorically organized. This dog book is divided into four chapters. Pink is for chapter 1, green is for chapter 2, yellow is for chapter 3 and green is for chapter 4. So there you have it! Another dog book to entertain and educate at the same time. Sounds like a very comprehensive read. Enjoy. Have a marvellous Monday. Thanks, gotta look into getting it so them peeps can figure it all out much easier then trying to read our minds! Mommy thinks she has flipped through that book before but she can't be sure. It sounds like a good book! That looks like a great book, Haopee! We're going to look for this one -- it would make a great gift for dog owners! That looks like a very good book! that sounds like a really good book and reference to have on hand! We'll have to look for it. Thanks for sharing! It is always nice to get a good recommendation when it comes to these types of books...there are SO many out there that are, frankly, just awful. Is there a "What if my peep?" version? Sounds like a pawesome book for the doggie peeps out there!! a dog owners version of "for dummy's". someday when we get a puppy, we'd have use for this. Oh I bet there are some doggy secrets in that book!! Sounds like a great resource! The mom always liked the idea that a parent (of children or critters) didn't have to be perfect, just good enough, but advice is so helpful. Sounds great! Now we all doggies will write a book called 'What If My humans....?'! hehehe..
Pet owners and those planning to get a dog would love this as reference. 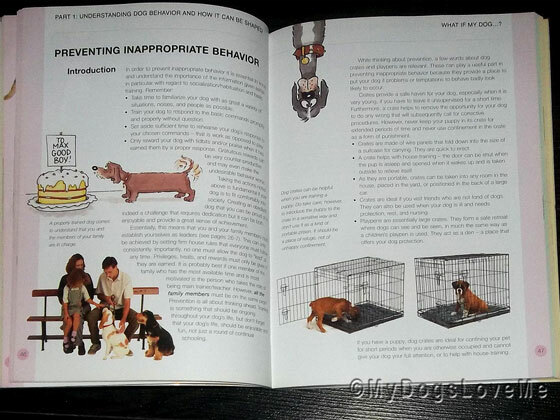 That's a good read for a dog -- "Preventing Inappropriate Behavior"